Simply put, our enthusiasm for great wine has evolved into a commitment to handcrafting outstanding wine that reminds us of some of the most important moments in our lives. Our focus is to create small lots of brilliant wines that individually, have their own story, pair well with a variety of foods and are enthusiastically enjoyed on their own. It all began in early 2005 while residing on the East Coast. During this period, both Michelle and I had jobs at a high tech firm working in sales and engineering. While we both loved wine and collected some of the best produced wine we could find over the years, we sought after more ways to become involved in the process of making wine. It seemed as if each bottle we opened with family or friends created a new memorable experience for us and they became stories. This linkage was one of the things we loved about wine, the appreciation of wine and the art of the story. We often enjoyed different varietals and styles of wines and the dream of creating our own began to flourish. In a drive to educate ourselves about the creation of wines we traveled to the West Coast . Our first goal was to learn as much as we could about viticulture and enology; Napa Valley held up to its reputation as being one of the best places in the world to accessibly discover the world of winemaking. Our second goal, was to determine how far we would take this desire to handcraft wines based our experiences and determine if winemaking was a lifestyle we were well suited for. After much research during the summer of 2005, we started our first Cabernet project with fruit sourced from Beckstoffer Dr. Crane Vineyard in St. Helena and never looked back. The last decade has been nothing short of an incredible journey. 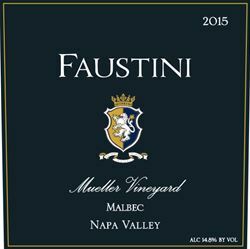 We have added new vineyards into our portfolio and grown the Faustini brand to include Velvet & Vinyl Sparkling and Play Date Wines. We remain focused on ensuring each bottle helps create a memorable experience and that you too can "Taste the Story".